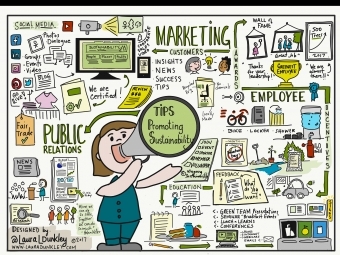 Finding ways to communicate your sustainability initiatives to your boss, your employees, your customers, and investors can be a challenge. Here are some creative ways to share your green story to help promote your efforts and build engagement. Employees are an important audience when communicating sustainability. You want to show them appreciation for their ideas and leadership, get feedback, and offer incentives to engage. Everyone loves to doodle! Put up a white paper banner in the lunch room, get a set of coloured markers, and let your team inspire your with their green ideas. Ask for feedback! One of the greatest things we can do to show appreciate is listen and make changes. When you can’t, let them know why. Help people understand the WHY behind your sustainability initiatives. Help people connect the dots to why they should be engaged with, and supportive of, your sustainability initiatives. Include articles, visuals, research, and insights on what is being done in your business, industry, community and globally. 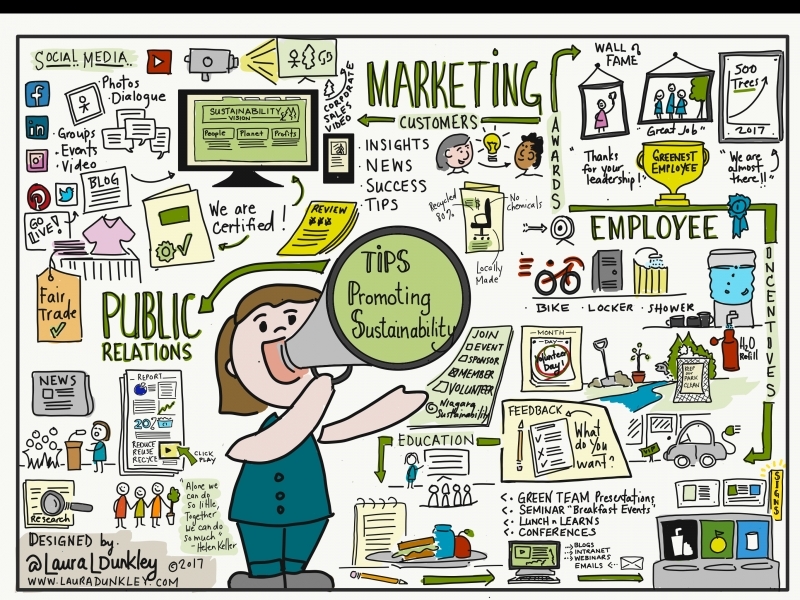 If you are facilities or the department in charge of the sustainability program, talk with your communications on how to best promote your story. If you are a business owner, marketing director, or President of a small-medium sized business, contact a communications consultant who specializes in sustainability or corporate social responsibility to help your with your campaign. Reporting | Make them creative & engaging! Visual graphics, videos, and interactive PDF are all ways you can make your sustainability report more interesting. It is more likely your investors, employees and boss will read your entire report if you add design to the text and number rich content. Website - sustainability statement / vision, news releases, success stories. Blog - write about your work with a specific category for Green Team and/or Sustainability. P.A. System - IKEA is one organization that shares their sustainability message on their store's P.A. system so people can hear when shopping. Have your sustainability story as part of your corporate video! Lead by example - business owners & CEOs should be examples for their employees on how to be an ambassador. Make sure you are engaged in the office green initiatives e.g. recycling. Leverage the marketing opportunity, networking, and support available by getting involved with various groups in your community that are proactive in supporting environmental and wellness initiatives in your local community. Make sure these groups align with your vision and values. Niagara Sustainability Initiatives, Niagara Land Trust, and Niagara Farm Project are some of my local community groups who are always looking for volunteers and sponsorship.